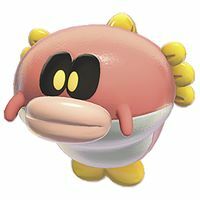 Splounders are flounder-like enemies that first appear in Super Mario 3D World. They are present in every Plessie-themed level, with the exception of Deepwater Dungeon. The group and Plessie approaches three Splounders. Splounders will either move side to side or remain stationary. They can be defeated by any attack, and will be stunned if Plessie bumps into them. They do not directly harm the player on contact, but will throw Plessie off course if bumped into. Jumping on a Splounder can provide a very decent bounce, and can sometimes even lead to Plessie reaching previously inaccessible areas. This page was last edited on December 15, 2018, at 21:46.